Merged with Burton Swifts in 1901 to form Burton United. The Burton on Trent is best known for its breweries, which sprang up in the mid eighteenth-century, making use of the mineral-rich local spring water to brew beers for export. In 1871 two association football clubs, Wanderers and Swifts were formed. Remarkably, both would become members of the Football League where they played each other for three brief seasons. Burton Wanderers were elected to the League having won the Midland League in 1893-94 following in the footsteps of their neighbours, Burton Swifts who had been elected two years previously. 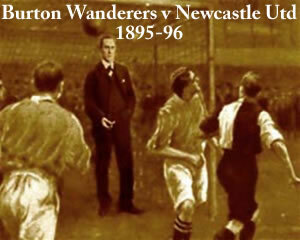 In 1897 both teams faced re-election and the Wanderers were voted out, their place being taken by Luton Town. The club rejoined the Midland League but in 1901, they merged with Burton Swifts who were facing re-election once again. The new club, known as Burton United continued to play in the League for another six years before it too lost its place and went out of business. There is no connection with the modern Burton Albion club.